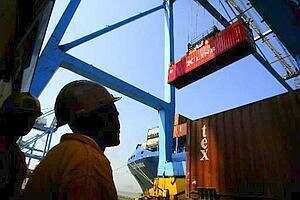 Infrastructure push: A container being loaded on to a ship at the ­Jawaharlal Nehru Port in Navi Mumbai. Arshiya International is building a container freight station near the port for Rs350 crore. Mumbai: Logistics company Arshiya International Ltd plans to invest Rs3,000 crore in the next three to four years for setting up free trade warehousing zones in India as well as abroad. Such zones are a special category of special economic zones, or SEZs, and facilitate import and export of goods in a one-stop notified area. Arshiya International, formerly called IID Forgings, is also providing information technology solutions for logistics and has secured in-principle approval from Board of Approvals under the ministry of commerce to set up such a zone near the Jawaharlal Nehru Port area in Navi Mumbai. “We have presence in logistics-related IT solutions, freight forwarding, logistics and training segment," said Ajay S. Mittal, managing director, Arshiya. Arshiya, which has revenues of about Rs200 crore and is listed on the Bombay Stock Exchange, has raised about Rs100 crore through private equity placement to fund some of its expansion plans. A report prepared by consulting and audit services firm KPMG estimates the total spending in India on logistics at Rs4 trillion. Enam Securities Pvt. Ltd, an analyst firm, has estimated the size of India’s container freight station and related container logistics alone at some Rs25 billion (around Rs99,750 crore). Mittal said that Arshiya was, until now, operating without a single, owned-warehouse or a owned-truck. “This would be the first logistics related physical infrastructure near Jawaharlal Nehru Port. The total capital outlay for next three-four years is around Rs3,000 crore. We are also building a container freight station near the port for Rs350 crore," Mittal said. Arshiya’s main entities include Cyberlog Technologies, which provides IT system and software development, BDP India & Gulf (shipping and logistics), Genco (logistics operations for retail sector) and Knowledge Centre (training division). Cyberlog is owned by Arshiya, while others are joint ventures. Mittal said Arshiya is also planning to enter into cold-chain logistics through an acquisition as well as through joint ventures. The company said it is also in talks with freight forwarding companies, which specialize in moving automotive and consumer goods, for an acquisition. Mittal added internal accruals will also be used for funding expansion projects. Arshiya competes with companies such as Gateway Distriparks Ltd, Gati Ltd and Container Corp. of India Ltd.